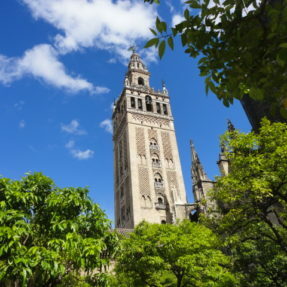 Melbourne was once the place in Australia to visit, to sample the coffee and café delights. Now Sydney has become the rival city with cafes and brunch spots springing up all over the city. Having lived in Sydney for over a year, I have had the opportunity to visit a lot of cafes. 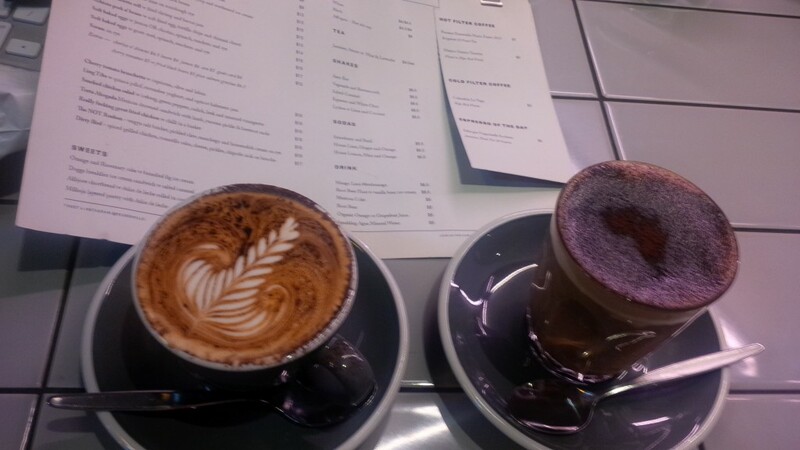 This is not an exhaustive list and I will be writing up a follow up post before I leave the city Down Under, but here are just a few of the places I visited and enjoyed in Surry Hills. This is my local café so I should be a bit biased, but anyone who comes to Cafe con leche will love this place. Open every day from 6am – 4pm, this is a little bit of Columbia in the heart of Surry Hills. My favourite is the arepas, which is a traditional Columbian breakfast served with 2 or 3 type pancakes (with cheese, corn or plain). 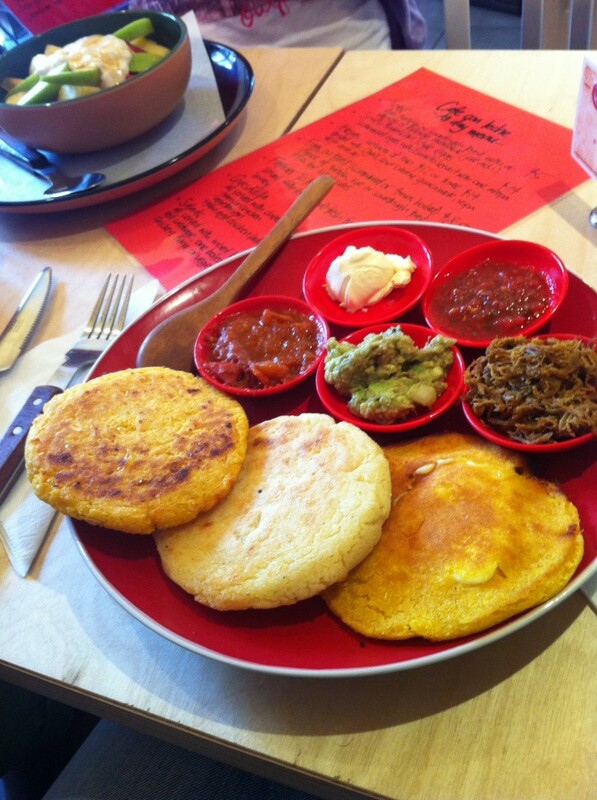 The arepas comes with ogao, sour cream, guacamole, ropa vieja and ajo. It costs $12 for 2 or $14 for 3. My other favourie breakfast is the Farmer Jo Muesli – served with (or without) fresh fruit, yoghurt and honey for $8.50. Drinks are very reasonable a coffee is between $3.50 and $4.00 and they also serve Colombian hot chocolate for $5.50. Fresh smoothies and fresh juice is $6.50. 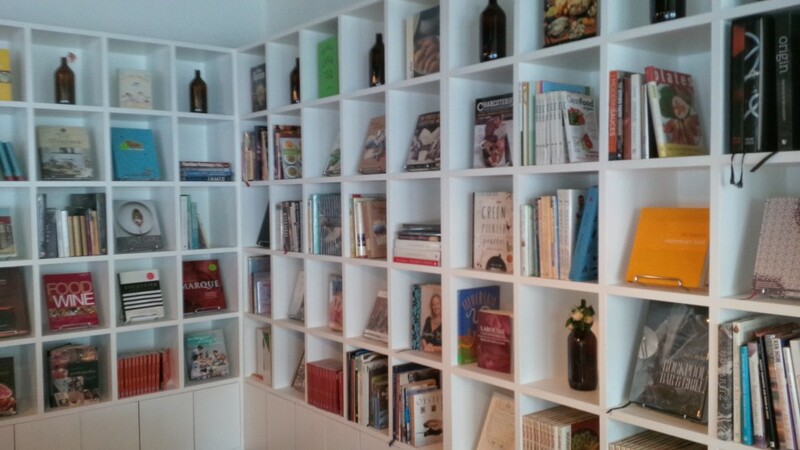 Recently renovated, the Book Kitchen is in the heart of Surry Hills, on the corner of Bourke and Devonshire street, right across the road from the Bourke Street Bakery. Night Quite Nigella wrote a great review about her visit there. I visited the Bourke Kitchen over lunch on a Friday when it was relatively quiet (compared to over the weekends). The staff were friendly and I was immediately served with water and a menu as soon as I sat down. There was lots of space at the table and a plus was there was free WiFi, as a blogger it is a basic requirement to do my job. Being a recently unemployed person, I chose one of the cheaper options, the egg and bacon roll for $11 and a regular cappuccino for $3.50. A small but very popular bakery, locals and tourists flock to this place every weekend. 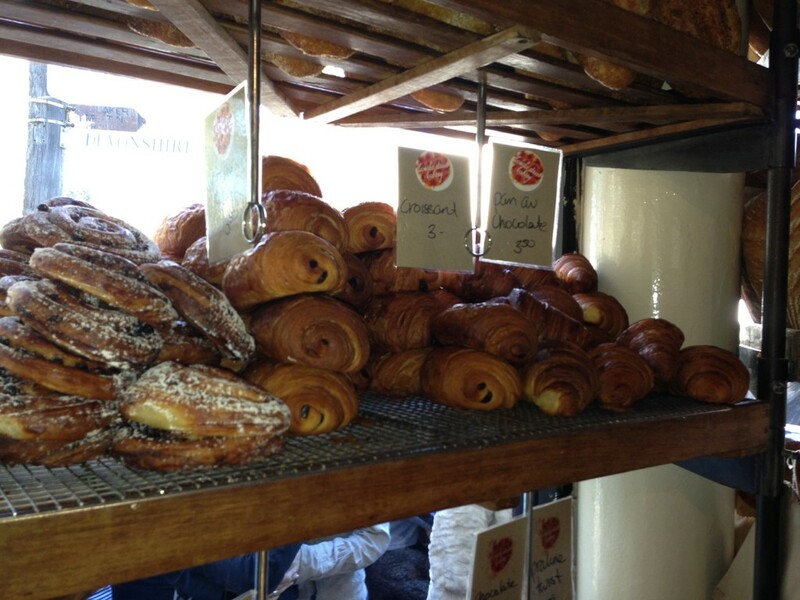 Even during the week the bakery is bursting at its seams. It is a good thing there is plenty of seats outside as there are only a couple of tables inside. Make sure you arrive before 10:00am to avoid waiting in the queue. This café in the heart of Surry Hills on Bourke Street, is named after the Roland TR-808 drum machine. Cowbell 808 is definitely the place for breakfasts. I love my pancakes and bacon and the staff were only too happy to add maple syrup and eggs to my favorite breakfast dish. The waiter and owner who served us was very polite and gave us a table outside, under the shelter of the terrace. The French café in Surry Hills on Foveaux street is another favorite to those in Surry Hills. There is a wide range of breakfasts and lunch menus at a reasonable price. They make their own jam, chutney, sauce and mayonnaise in house. 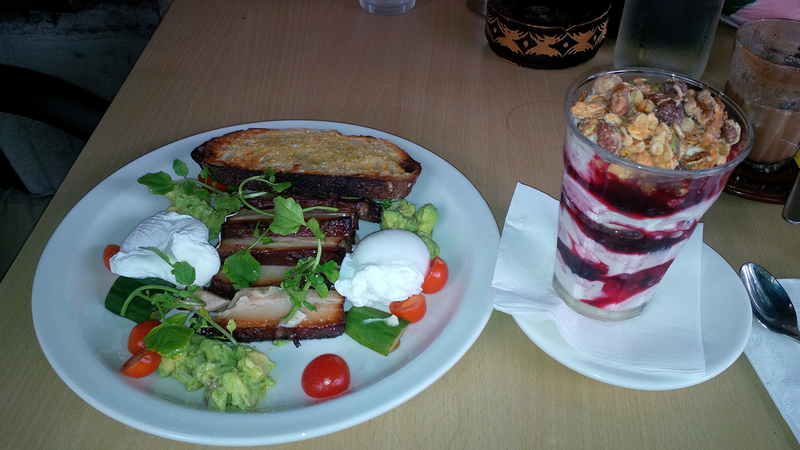 I went with a friend for breakfast, ordering the muesli and fruit for $8, while he ordered the pork belly sandwich which was apparently delicious. I will have to order that next time I visit. The cafe had tables inside and out so being a nice day, we sat under the cover of the terrace on Foveaux Street, watching the people go by. Lumiere is at the top end of Bourke Street, by Taylor Square. A modern restaurant well lit with all wide range of breakfast options which is served all day. The cafe is buzzing from early in the morning until late afternoon. 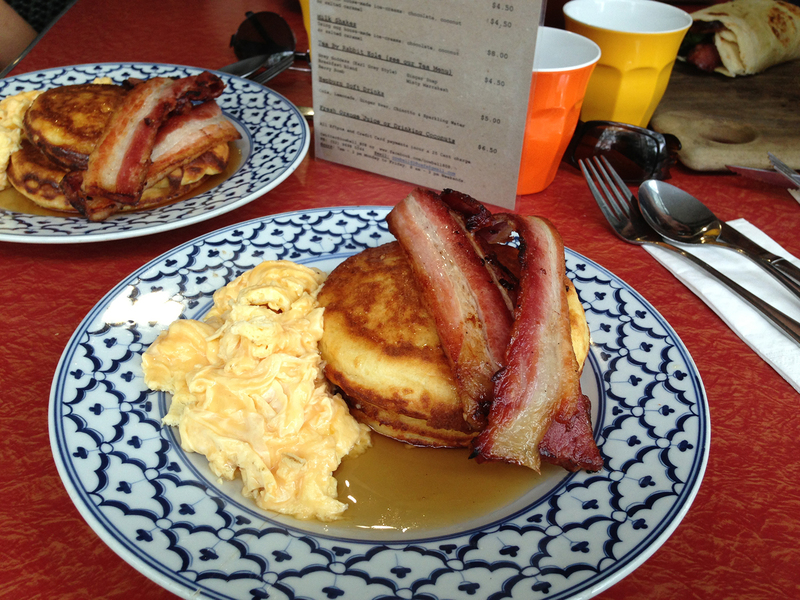 This is one of the best places in Sydney for pancakes. They were very generous portions with a big pile of bacon as well, super delicious. The staff were friendly and the order taken and served very promptly. A former paper mill, this has now been turned into a cafe and coffee roastery. 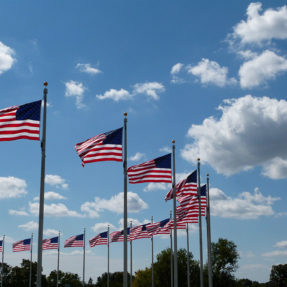 It is open daily 7:00 – 4pm and on Sundays, opens 30 minutes later. Every Friday at 10am, they have a coffee lab where the public are welcome to come in for coffee tasting. The owner, Russell Beard had a successful cafe in Mosman before opening up Reuben Hills and his success is paying off. The unique thing about Reuben Hills is that they roast the beans (from South America) themselves. The “Not Reuben” sandwich is a favorite which my friend had and loved. Next time I think I am going to try that, along with the spicey fried chicken. This is a famous cafe on Crown Street, set up by Bill Granger. 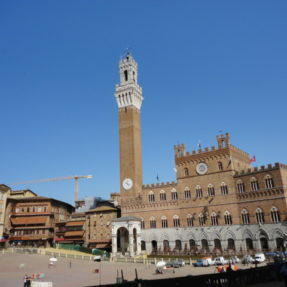 He is known for his relaxed style and fresh-local ingredients in his dishes. 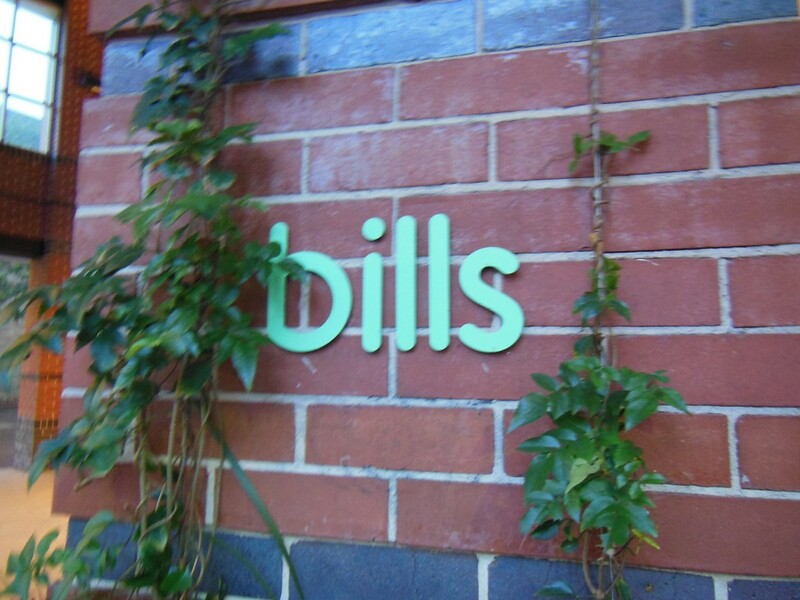 The first “bills” was set up in 1993 in Darlinghurst and was an immediate success. I had the famous hot cakes with banana and honeycomb butter at $20 when I visited the restaurant on Crown Street. Luckily we did not have wait in line to get a table, but most weekends especially when visiting at lunch involve a 20 – 30 min wait. Bill Granger’s restaurants have become so popular that he also has a few in Japan and one restaurant in NottingHill which I will visit when I go back. 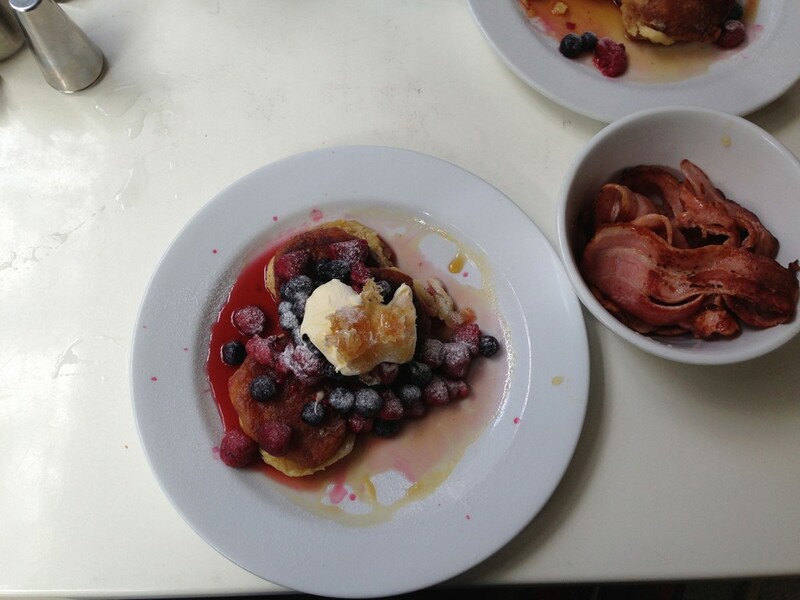 Next time you are in Surry Hills, why not visit one of these cafes for brunch? If you find a good place for brunch when you are next in the area, let me know. Contact me on Twitter.